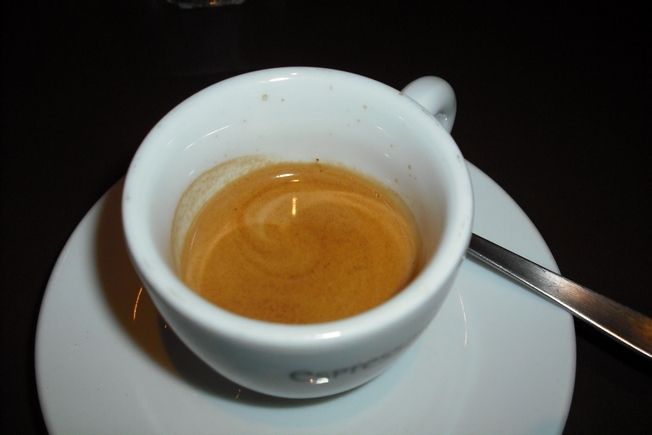 Many people may no realised that espressos are usually made from a specific blend. In a blend is a mixture of two or more different origin of coffee beans. 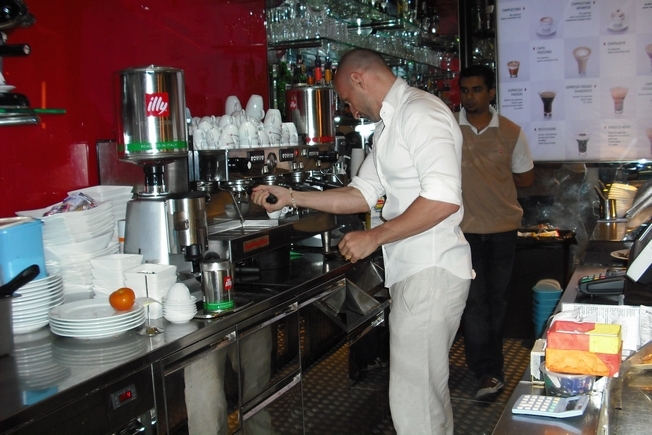 James Hoffman, the World Barista Champion of 2007 used a single origin of beans for his espresso and won. That is rare. But if you want to enjoy or experience the many different taste of coffee, getting specific single origin is the way to go. Since the espresso brewing methods rarely able to bring out all the complexity of single origins, we will have to explore other brewing methods like drip, french press, moka pot and others. 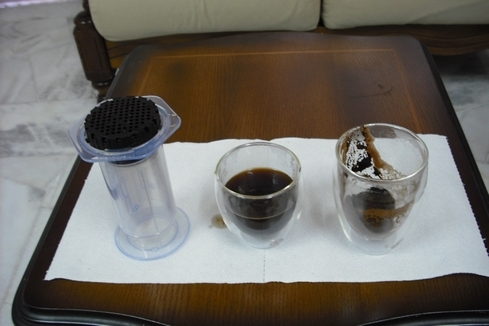 My most prefered brewing methods for single origins is definitely using the Aeropress. I recent got some very good quality of Costa Rica from highlanders. Freshly roasted. Getting ready. 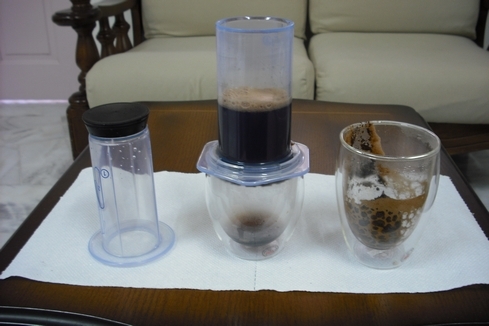 On the left is the Aeropress, 2 glasses, costa rica in a vacuvin coffee saver and pitcher for hot water. Close-up shot of some costa rica beans. I used about 20g of coffee to make 5oz of liquid. 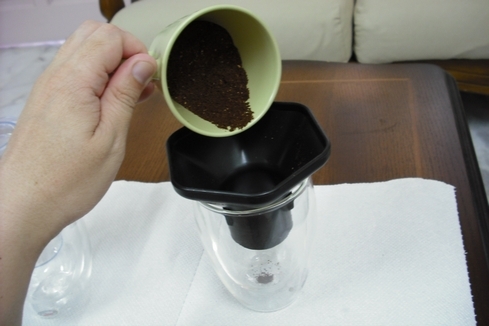 Freshly grind the coffee and pour into a cup or glass. That funnel you see above is part of the accessories from Aeropress. While the coffee is steeping, get the Aeropress ready. 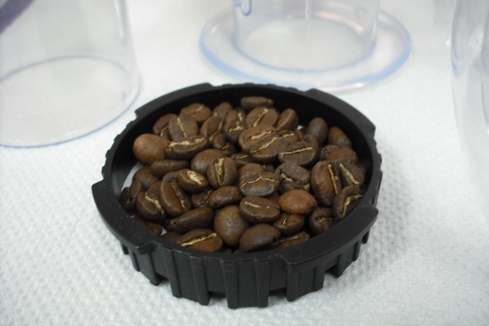 After screwing in the cap with the filter, rest it on a cup or glass. Pour all the coffee into the Aeropress. Steadily, insert the pump-like devise and slowly press down. Press all the way down. 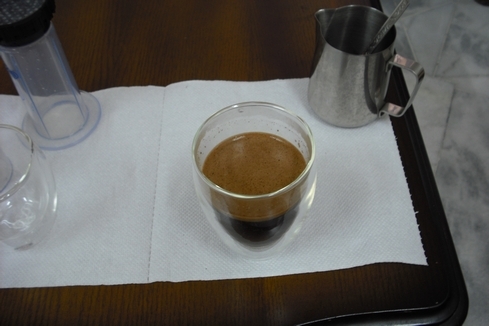 Tadaaaa… a lovely cup of Costa Rica coffee, the Aeropress way. Aromatic, with bright fruity taste of citrus. 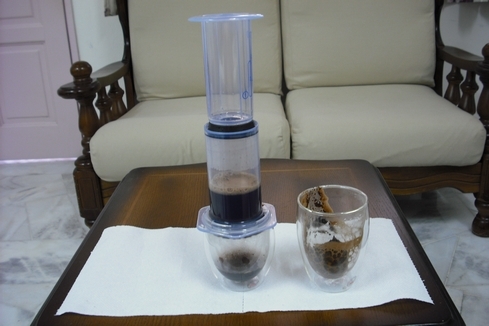 With the Aeropress, you can truly experience coffee in a new way. There are many variants you can tweak. 1. 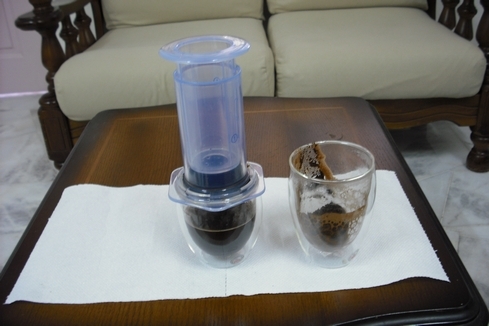 For stronger coffee, just use more coffee powder to the ratio of water. 2. Increase the steeping time to 1 min or 2 min if you want more caffeine or you want a more bitter taste. Decrease the steeping time for brighter taste. 3. 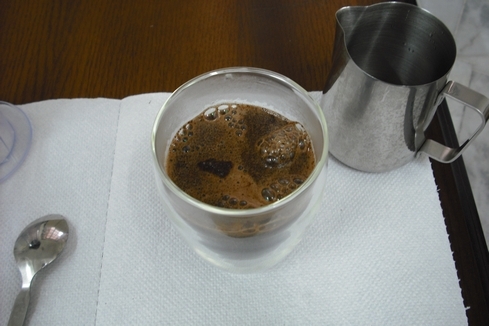 Or make a stronger extraction into a larger pitcher, add extra hot water to make coffee for 2 or 4 person. Cleaning up is a breeze. The entire process including cleaning up take only 5 min or less. The Aeropress is the invention of genius. It doesn’t looks as cool as a stainless steel moka pot or a classy french press. But it is durable, convenient and brings out excellent the potential of any single origin coffee. Now, it is available for RM150. When I bought mine 3 years back, it cost me RM250++. Deliver anywhere in Peninsula Malaysia for extra RM10. This entry was posted in Aeropress, Coffee, Coffee Beans, Costa Rica, Malaysia, Single Origin on September 30, 2008 by KF Chan. 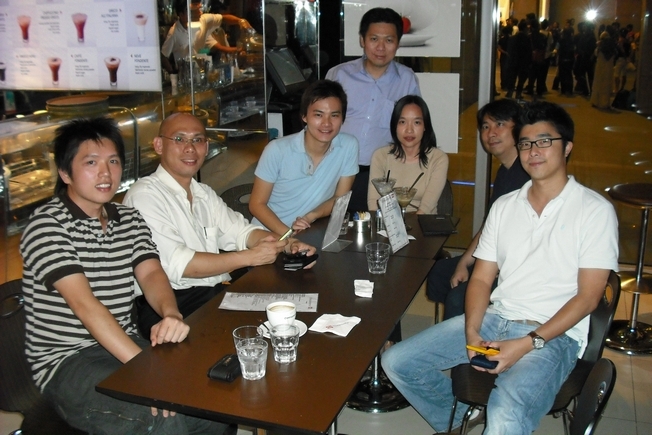 Our second gathering at Espressamente on Friday, 26th Sept, 2008 turned out to be an interesting session. I reach there around 8pm and Michael has already set up a table for us. Went to grab dinner. Went back there by 8.30pm and Oscar was already there. We took our seat and within the next 10 minutes there were 5 of us. Oscar, Lee, Christopher, Mun Shin and myself. We were ready to order. First round, single espresso for all the guys while MS ordered an americano. Special request to have Michael pull us the shots. My espresso was the last to be served. The photo did not do justice to the espresso. Mine was not bad. 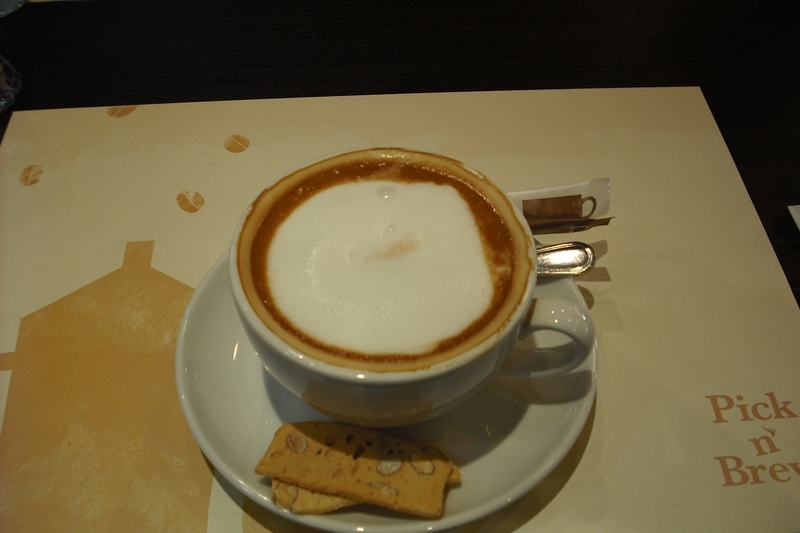 Typical of Illy, it was smooth with pleasant acidity. Lucky for me and not so lucky for some because they were politely waiting for every drinks to be served. Espresso is just too delicate to wait. Some of them did not enjoy them as much as me. Guys, you all can give your comments, whether good or bad. One tip for all. Whenever you order an espresso, do not be polite and wait. 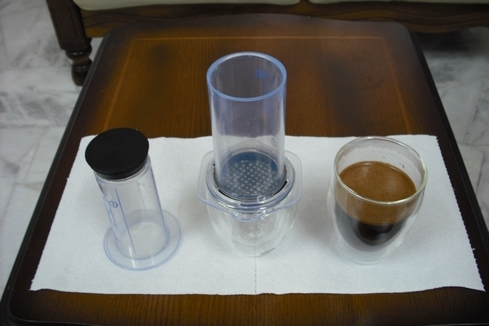 Espresso must be enjoyed on the spot, immediately after extraction. 3 minuted is too long a wait. Michael joined us for a while and chat about some stories of espresso in Australia and Italy. By 9.15, everyone turned up including Jean and Eric. After their round of espresso and more chit chat, it’s time for dessert. 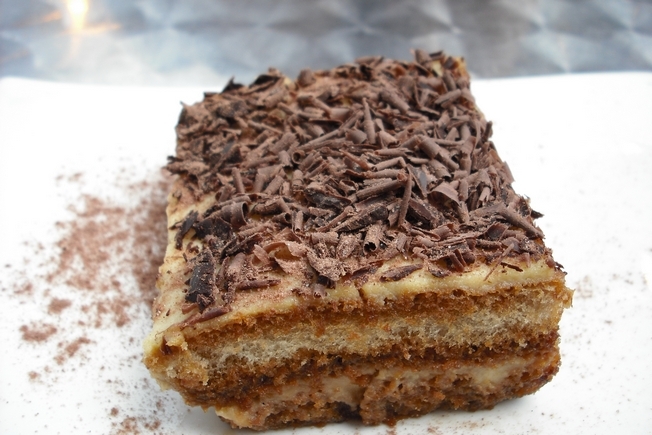 This is a variant of the afogato. 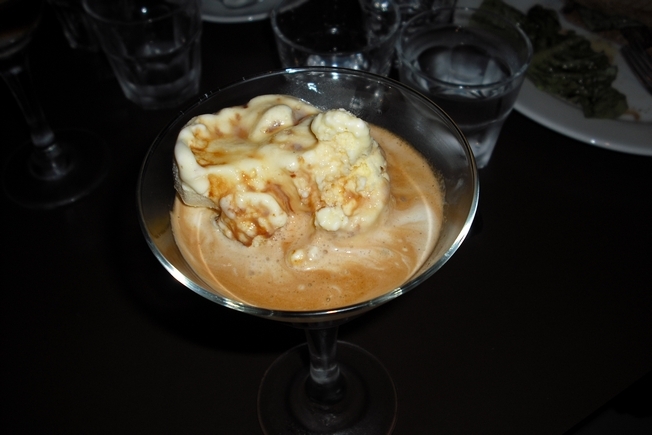 Afogato is espresso pour unto a scoop of vanilla ice-cream or gelato. This version has an addition of liquer (which we suspect is Kahlua). If you like sweet stuff, this is excellent. Personally, I like them less sweet… meaning next time I will have the original afogato without the liquer. There were 2 more specialty drinks with mixture of liquer that I forgot to take a picture of. If any of you guys know what is the name of the other 2 drinks, do comment about it. 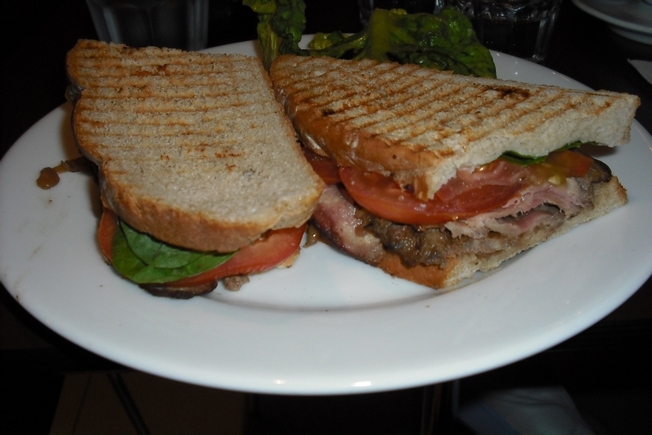 Eric ordered a panini sandwich, not sure if it is roast beef or chicken, but it looked really yummy. So, that’s the story of our 2nd Coffee Lovers Gathering at Espressamente. Cannot believe it… Went back to Espressamente on Sunday because Sookie missed the event on Friday and to catch up. 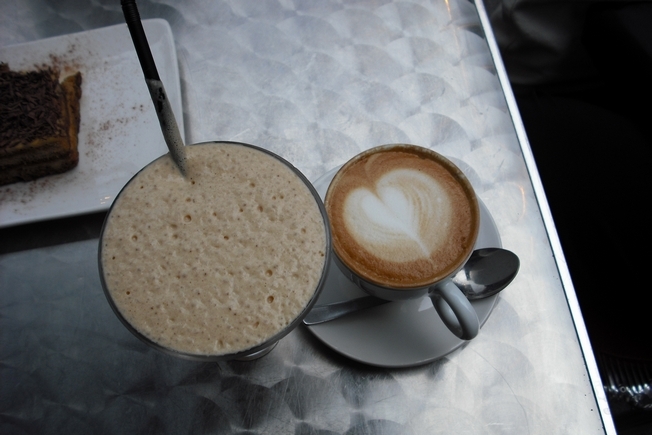 Iced Cappuccino and the Traditional Cappuccino. I ordered the iced capp for a change. Their Iced Capp is delicious.. creamy and nutty. The traditional capp looks great, with nice microfoam. But alas, Sookie is really no coffee lover. She needed to put TWO pack of sugar :O Next time, she should just get a mocha or some dessert sweetened drinks.. hahaha. Mun Shin and Tiramisu. I know, both of them are nice. 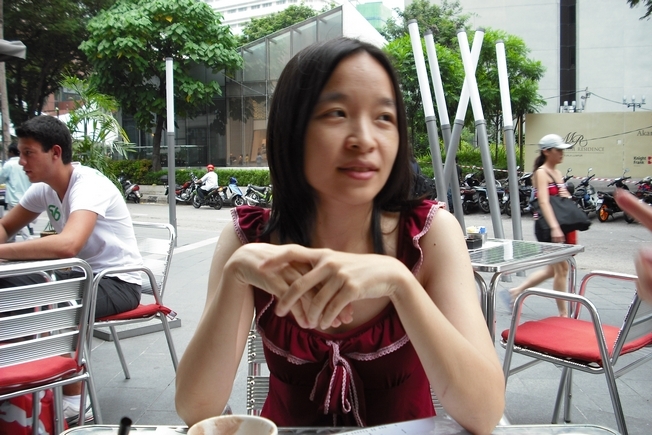 This entry was posted in Americano, Cafe, Cappuccino, Coffee, Espressamente, espresso, Malaysia, Tiramisu on September 30, 2008 by KF Chan. When I heard about this cafe, I was excited. It was an exciting concept. 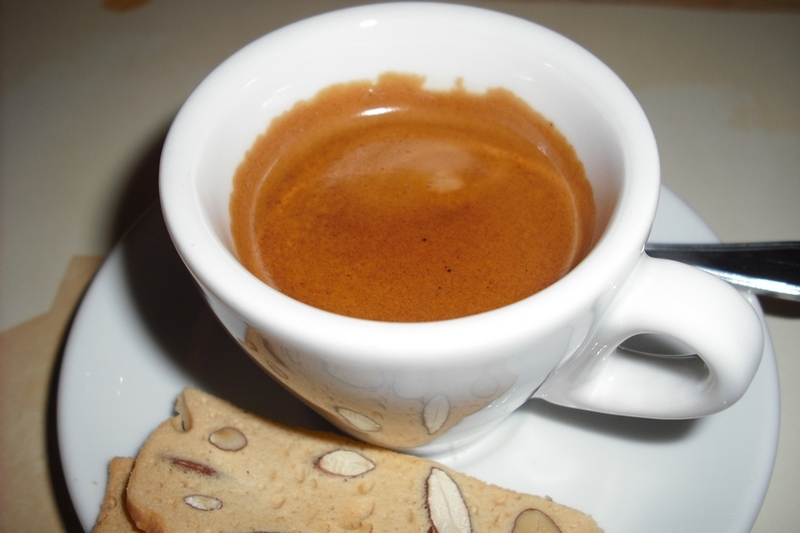 Apart from the traditional Italian style coffee like espresso and cappuccino, they have a selection of single origins. Their single origins are Brazil, Columbia, Kenya, Sumatra and Indonesia. You then can select the single origin you like and they will grind and brew for you in a Moka pot or french press (they also have this really expensive looking device that cost RM30 a brew, which I dare not risk). You can even mix the different single origins to produce a different profile of taste. I think this is a unique concept and it is great that single origins are promoted. It offers a great option to coffee lovers. You don’t call yourself a coffee lover if you ONLY like espresso or cappuccino or latte. 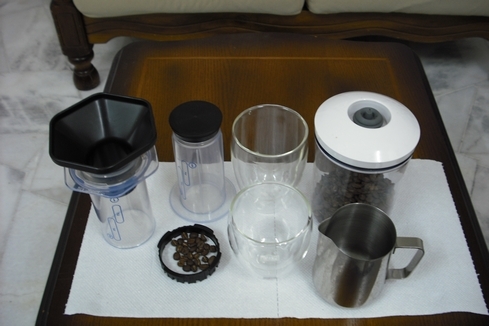 Coffee lover or coffee connoisseur if you don’t try different type of coffee and brewing methods. I know place like starbucks also offered single origins, but how many people would order that. I talk to the supervisor there and she says the coffee were roasted locally. Sounds great… until I ask how fresh. 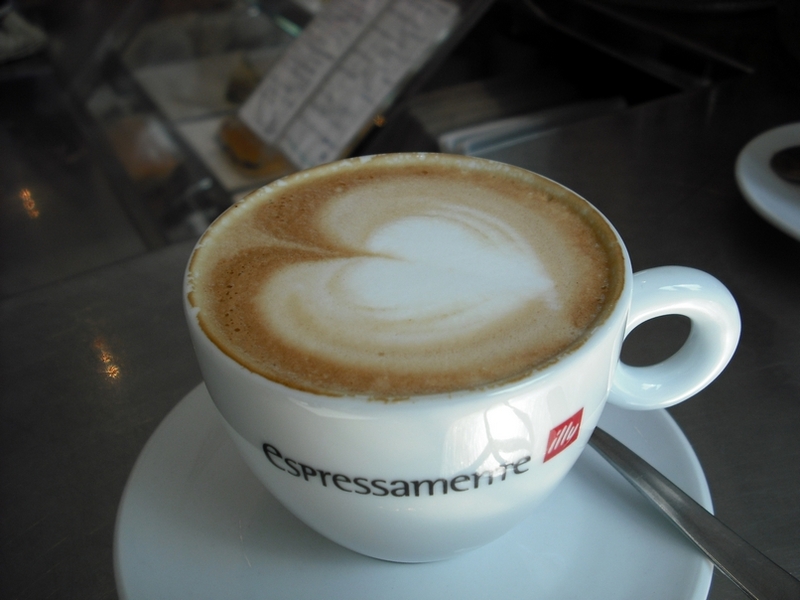 When we go to Espressamente or Segafredo, we don’t ask how fresh. We know they are not really fresh. They do need to travel a long way from the roasting plant to warehouse to storage and etc. In a sense, they compensate their lack of freshness by having properly trained Baristas, maintaining the cleanliness of the machine, microfoaming their milk and all the other things they can control. And if they can maintain the consistencies of the things they can control, I salute them. But if you locally roast and don’t know how fresh is the coffee??? Don’t know when was the roasting date? That was disappointing. But then, I remind myself to judge the coffee by what’s in the cup. My first order is an espresso. It looked better than it’s taste. The crema was thin (though better than any Starbucks), kinda bitter but not horribly bitter. It’s not really bad but more like a bit bland. Nothing really special unless what you want is just a strong cup for the kick. 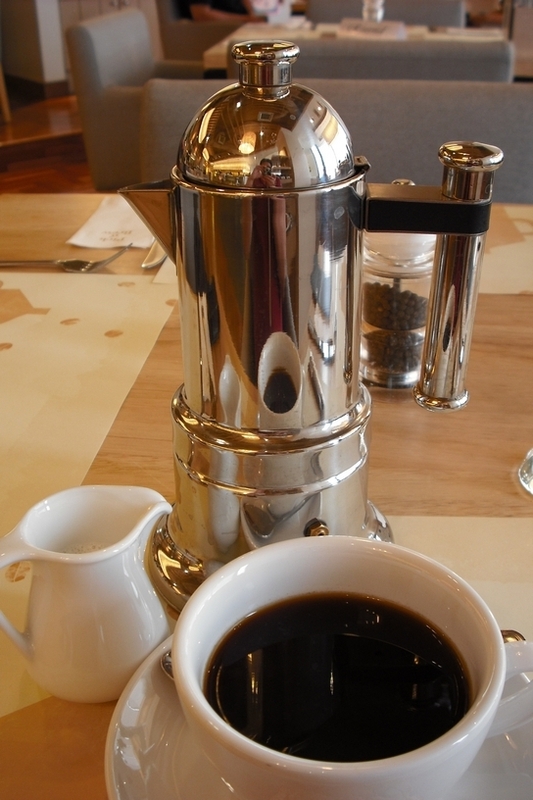 Next, I have a moka pot brewed Kenya. I must say the Moka Pot just looks cool. 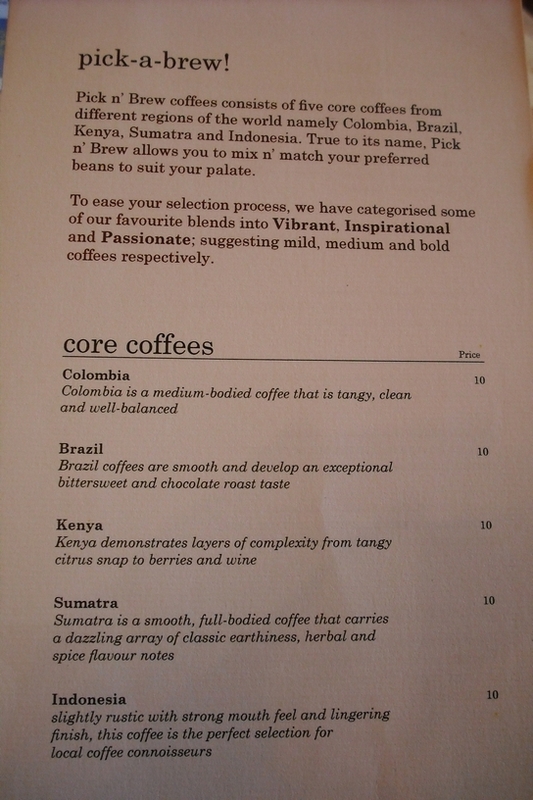 And surprisingly the Kenya was not bad at all. There’s hint of fruitiness with pleasant acidity. Quite a nice clean cup of Kenya coffee. They also gave some warm milk along with it. Those are just warm milk… not microfoamed milk. Anyhow, if you want to enjoy the delicate taste from single origins, ditch the milk. I think I know why the espresso was nothing to shout about. I took a peek while this guy was making my cappuccino. He used a portafilter that was on the tray instead of one in the group. I have no idea why in the world they use a cold partafilter. The funny thing is, after he tamped, he removed an existing portafilter in the grouphead and put in on the tray and insert the cold portafilter for brewing? It’s like he’s making sure he has a cold portafilter for use later. Mind boggling. This is one big cup of cappucino man. Certainly not the traditional 6oz cup. I would say at least 10oz or 12oz. The milk is not really properly microfoamed. So, is it bad. Well… not really that bad, especially if you like a lots of milk. I would say the saving grace is that they use Farmhouse Full Cream. Currently the best quality of milk for cappuccino and the most expensive. My verdict… Pick n’ Brew got potential especially if you want to try different kind of single origins. Hopefully they can maintain the freshness of their coffee. And they certainly need to improve their Barista training. I wouldn’t want to spend any money on their Espresso and cappuccino… unless someone is buying me the drink. They currently got 2 outlets. One in One Utama, just above Jusco’s supermarket. The other is hidden somewhere in Glenmarie-hicom industry area. This entry was posted in Barista, Cafe, Cappuccino, Coffee, Coffee Lover, espresso, Malaysia, Pick and brew, Pick n' Brew on September 26, 2008 by KF Chan. Irving, Christopher, FC Lee, Oscar, Eric, Jean, KF Chan & MS. If you are a coffee lover like many of us here, and you are in KL, do come and join us for a cup of coffee and share some coffee stories too. You can find tips (or give) on how to make the best coffee at home, where to buy fresh roasted coffee, where to find the best cafe in Malaysia and etc. With enough of us, who knows… we form our own club and maybe get special discount at good cafes serving good coffee. (Note: We are not interest in discounts from cafe that serves horrible coffee). Date: 26th Sept 2008, Friday. The place has limited seating and I want to reserve the place. So, please confirm attendance. 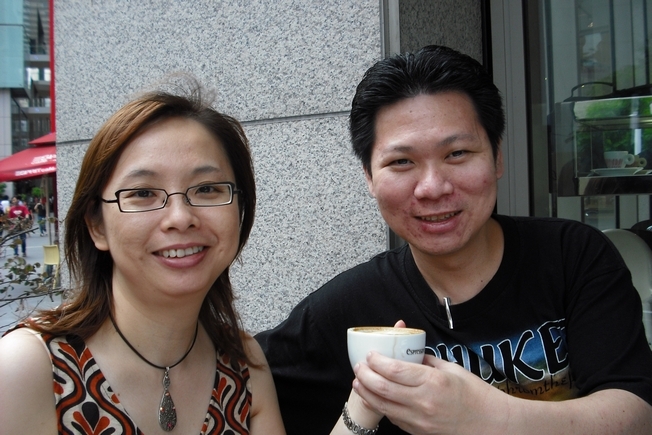 This entry was posted in Cafe, Coffee, Espressamente, Malaysia on September 23, 2008 by KF Chan. Sorry for the late posting. Have been super busy preparing ISO9001 at work. Finally, after all these while of faceless communications via email and blog, we manage to have a Coffee Lovers gathering. It was Friday night, 29th August 2008 at 9pm. 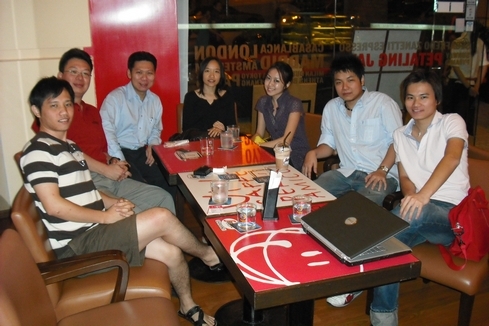 (Left to right) Wee, Irving, KF Chan, Mun Shin, Michelle, Kevin and Jean. I personally had a good time knowing all these people. Among our midst, we have people with a diverse background… Enginner, IT Support, Marketing, Software Developer, Nurse, Designer, Cyber Cafe Owner, and Entreprenuer. Jean was telling us of some Kopi Luwak story. We shared some good and bad coffee experience as well. Resources for fresh roasted, high quality coffee is in demand. Places to get proper espresso machines. Some are contemplating cafe business. So, how’s the drinks in Segafredo? I leave that for you guys to comment. Only 3 of us tried the espresso… two of us found it lacking and one was ok. But then, espresso has always been hits and misses. 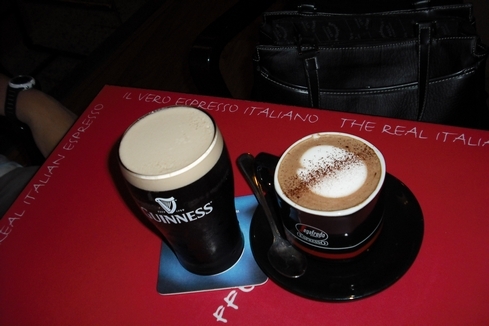 Guiness Draught and Cafe Mocha (They got a different name which I cannot remember). I find the Guiness draught excellent. The Mocha looks nice. Milk was nicely microfoam. In fact the few cappuccinos that we ordered, all of them were decently microfoamed. Some were excellently done. But properly frothing of milk is only part of the equation. As to the taste, I leave it to you guys to comment. I also tried their spaghetti and it is value for money. Jimmy, the manager was nice and offer us some snacks on the house. OK guys, over to you. P.S. Anyone got suggestions for next gathering? 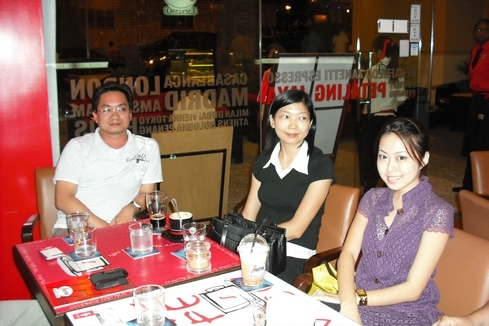 This entry was posted in Cafe, Cappuccino, Coffee, Coffee Lover, espresso, Kopi, Malaysia, Segafredo Zanetti Espresso on September 10, 2008 by KF Chan.